Welcome to Flatpicking Guitar Magazine Volume 20, Number 3 (March/April 2016). In this issue we feature Blue Highway guitarist Tim Stafford on our cover. Additionally, we feature Jim Nunally who currently performs with John Reischman and the Jaybirds, the David Grisman Bluegrass Experience, and singer Nell Robinson. 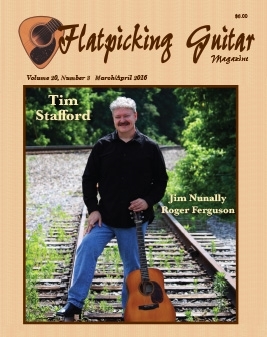 In this issue we also feature Roger Ferguson, I talented multi-instrumentalist from Washington state who won the National Flatpicking Guitar Championship in Winfield, Kansas way back in 1979. Of course, our regular cast of columnist are also here to provide you with a lot of great tunes. We hope you enjoy this issue of Flatpicking Guitar Magazine.